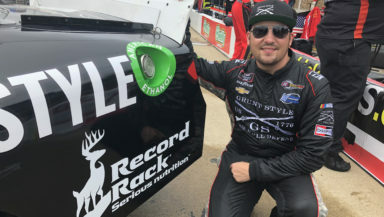 Concord, NC (February 11, 2019) – Spencer Boyd is excited to welcome back a familiar partner in Cargill’s Record Rack® premium game feed brand, as an associate sponsor for the 2019 NASCAR Gander Outdoor Truck Series Season. Sportsman’s Choice® Record Rack® wildlife products are engineered to attract and nourish deer for overall health and antler development. The Sportsman’s Choice® line of products include wildlife feed for deer & elk, turkey & gamebirds and pond & trophy fish. Record Rack® like “Golden Deer Nuggets™” and “Sportsman” products help attract and grow a bigger class of bucks. Whether you’re a wildlife watcher looking to see more deer on your land, or an avid sportsman looking to bring in a trophy, they’ve got the right feed to meet your goals. Record Rack® launches their activation with Spencer Boyd and the Young’s Motorsports No.20 Silverado this Friday at the season opener Daytona International Speedway.